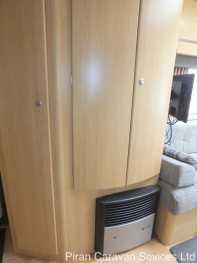 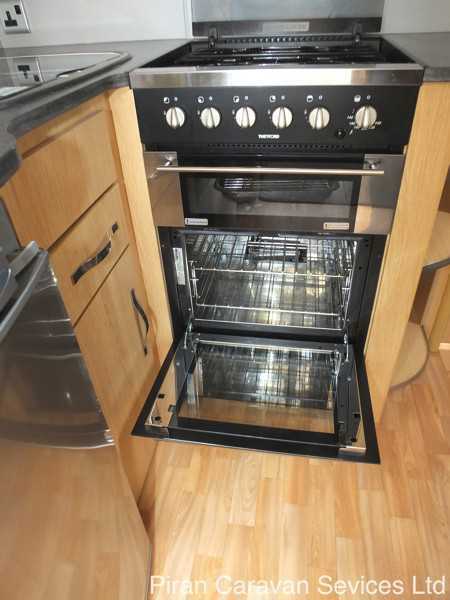 A lightweight and high spec 2 berth caravan with up date date equipment and construction, the Coachman Pastiche 470/2 is a very high specification 2 berth caravan with superior levels of interior luxury with the fixtures and fittings being of a noticeably high standard. 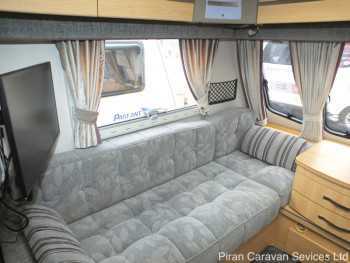 This caravan could easily be towed by an average sized car and will be ready to hitch up and go! This well-cared-for caravan is in excellent condition, fully serviced and damp-checked by an independent specialist workshop. 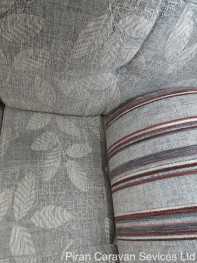 The caravan is Cris registered and comes complete with all the original manuals and paperwork as well an array of useful caravanning extras including a dealer fitted motor mover. 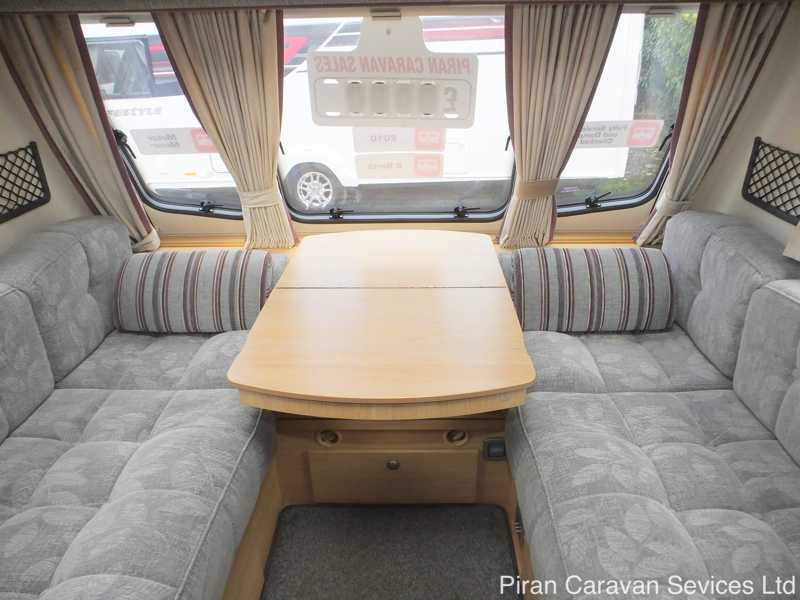 The caravan is built on an AL-KO galvanised chassis, with shock absorbers, gas assisted handbrake, an AL-KO stabilising hitch and heavy duty corner steadies, the body features thick aluminium sidewalls, acrylic capped ABS front and rear panels and a laminated roof. 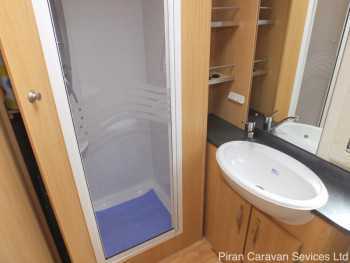 Grade 3 insulation in the walls and styrofoam laminated floor and ceiling ensures that this caravan has the best thermal insulation in its class. The gloss white exterior finish is set off by attractive grey Pastiche decals and 'Vortex' silver alloy wheels. 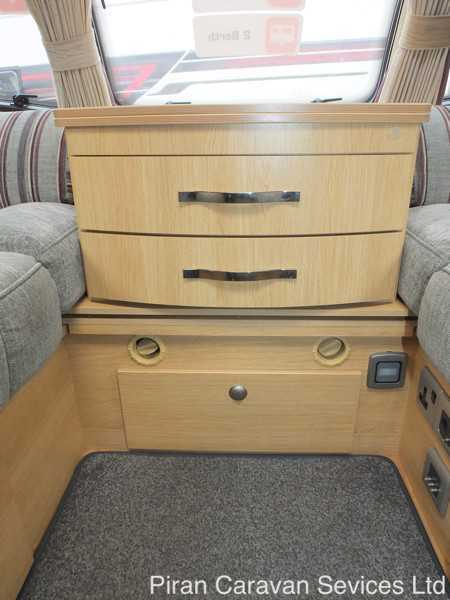 There is a 13 pin plug for the towing electrics, an LED awning/exterior light and an external locker with a 230V socket and an external BBQ point. The one-piece exterior door with window, blind, flyscreen and waste bin leads to a spacious and impressively appointed interior. 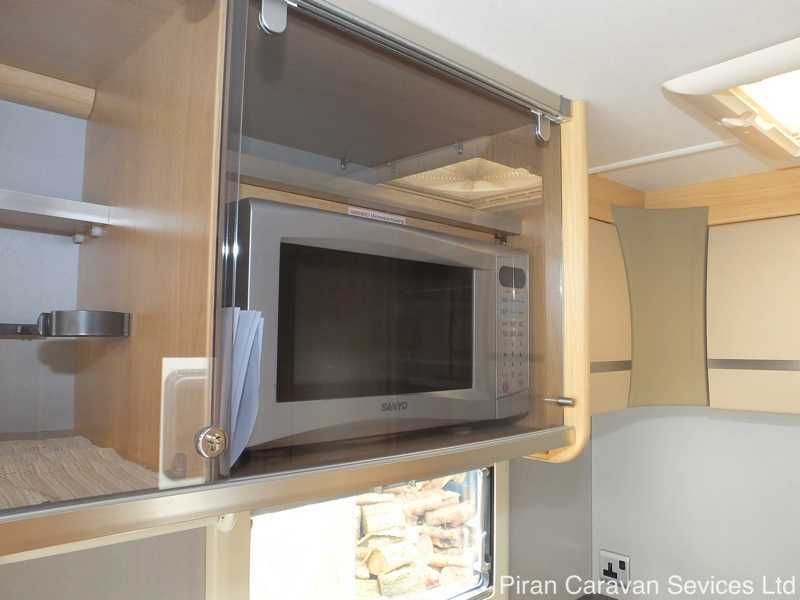 At the front, 3 panoramic style polyplastic windows, like the windows throughout the caravan, are fitted with night latches, blackout blinds and flyscreens. There is a large lounge area with two single beds or a large double utilising a pull out slat system mounted under the chest of drawers which has a fold-out table. For mealtimes, there is also a fold away dining table which has its own storage compartment. 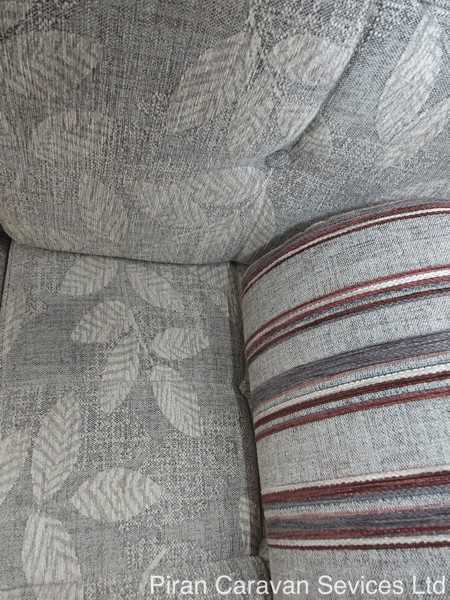 The spaceframe seating lifts up to acess a large storage space underneath and is upholstered in an attractive and practical stone fabric, complemented by matching curtains, bolster and scatter cushions and there are matching drop in carpets to cover the wood-block effect flooring. There is plenty of storage in the overhead aircraft style lockers which, like all the furniture in the Pastiche, are finished in Coachman 'oak' effect. There are two TV points with 12v, 230v and aerial sockets, giving a choice of locations for a TV, with signal provided by a Status 530 directional aerial. Above the sitting area is a Heki 2 panoramic roof light giving a light and airy feel. 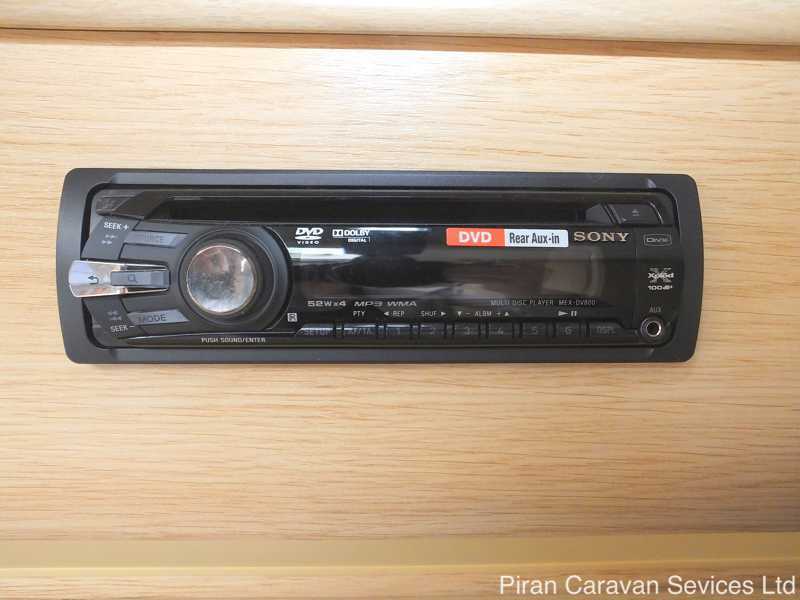 There is a Pioneer branded DVD/CD/MP3 player conveniently located within one of the over head lockers. A well-appointed kitchen is L- shaped and is positioned in the middle section of the caravan. 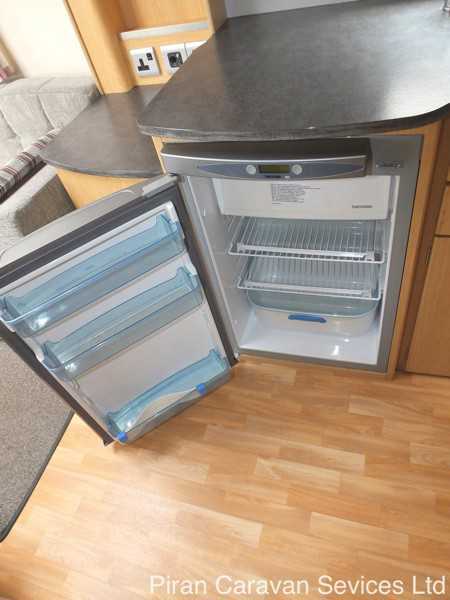 The L-shape is very practical and gives the kitchen area a feeling of space and maximises worktop area. 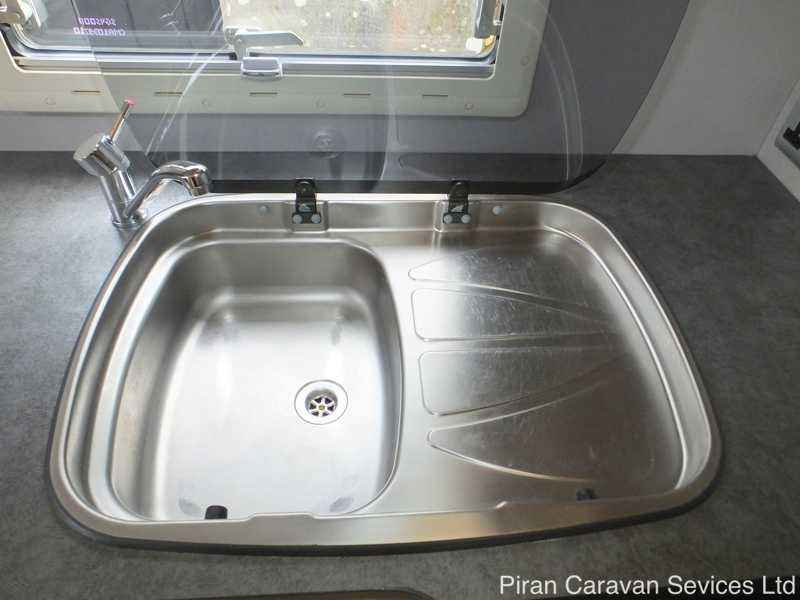 The kitchen is equipped with a Spinflo Argent recessed stainless steel sink and chrome mixer tap, with washing up bowl and chopping board. 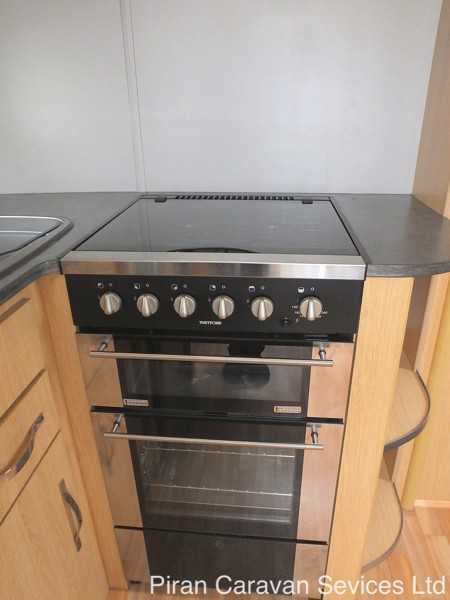 There is also a spinflo 4 burner gap hob with electronic ignition and flame failure device, and below is a domestic style glass-fronted Spinflo thermostatically controlled oven and grill and a built-in 800w microwave oven. 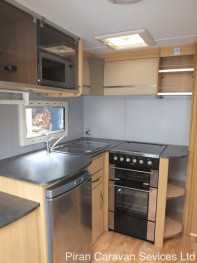 There is ample food/utensil storage space and worktops and a bi-directional 3 speed Omnivent fan set into the ceiling. 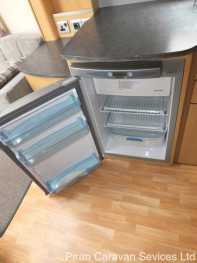 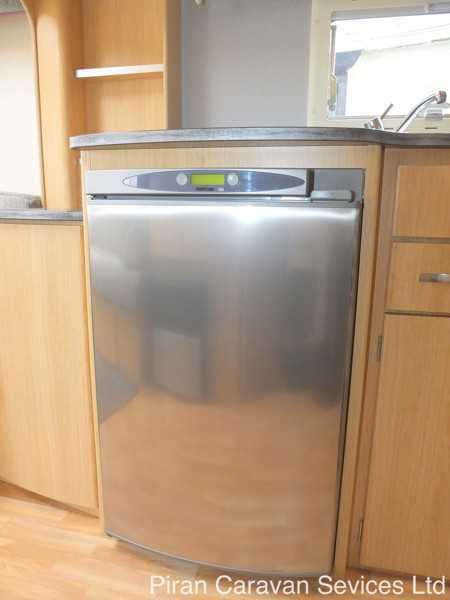 Completing the kitchen equipment, is a Thetford 107 litre 3-way fridge with freezer compartment. 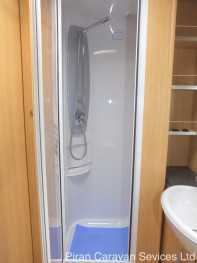 On the other side of the caravan is a large wardrobe with hanging rail and plenty of space for clothes. 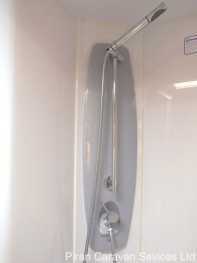 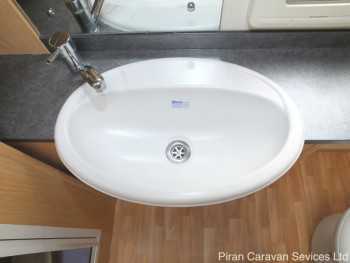 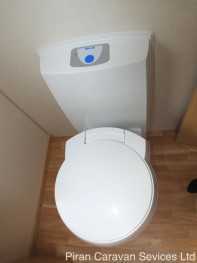 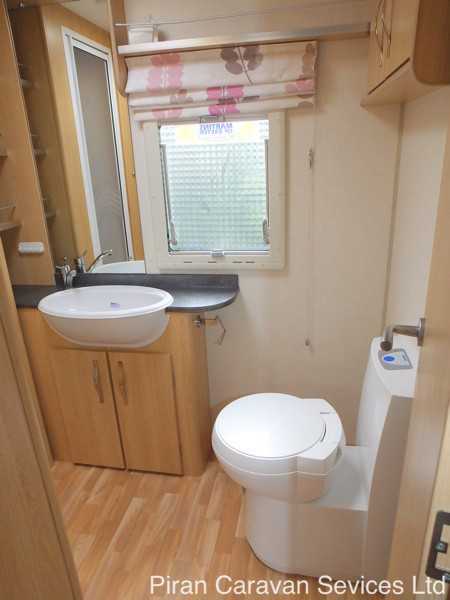 A domestic style door and handle at the rear of the caravan leads to the spacious washroom, which features a Thetford c-250 cassette toilet with electric flush, a spearate lined cicrcular shower unit with ABS shower tray, a white ABS sink in a vanity unit, as well as a mirror. 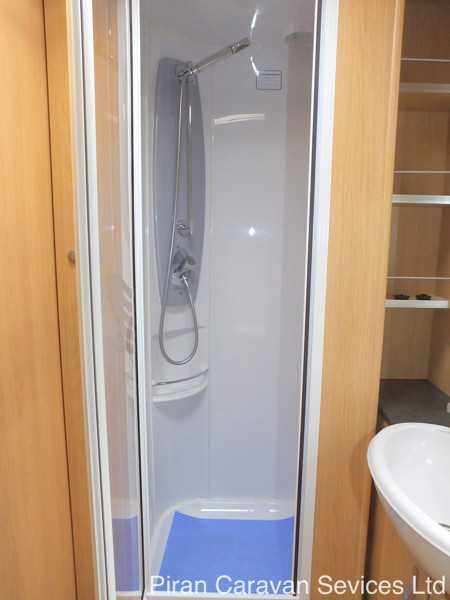 The space in the washroom makes it ideal for use as a private changing room. 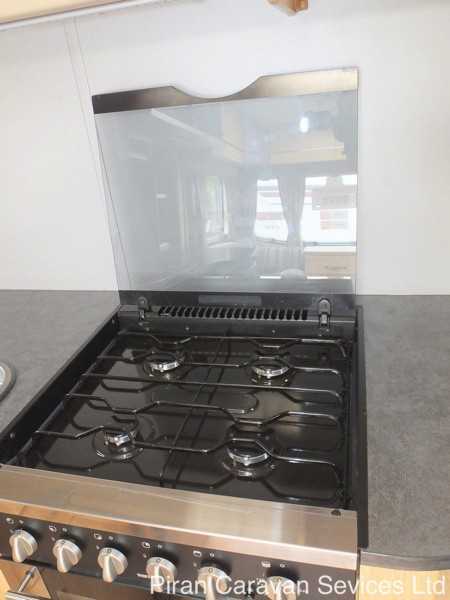 Heating in the Pastiche 470/2 is provided by the dependable and effective Truma 3002 Ultraheat blown air heating system (dual fuel), and the Truma Ultraflow system provides hot water for the kitchen and washroom on demand. Lighting is a mixture of 12v and mains 230v lighting, including LED corner ambient lighting, task lighting and ceiling lights. 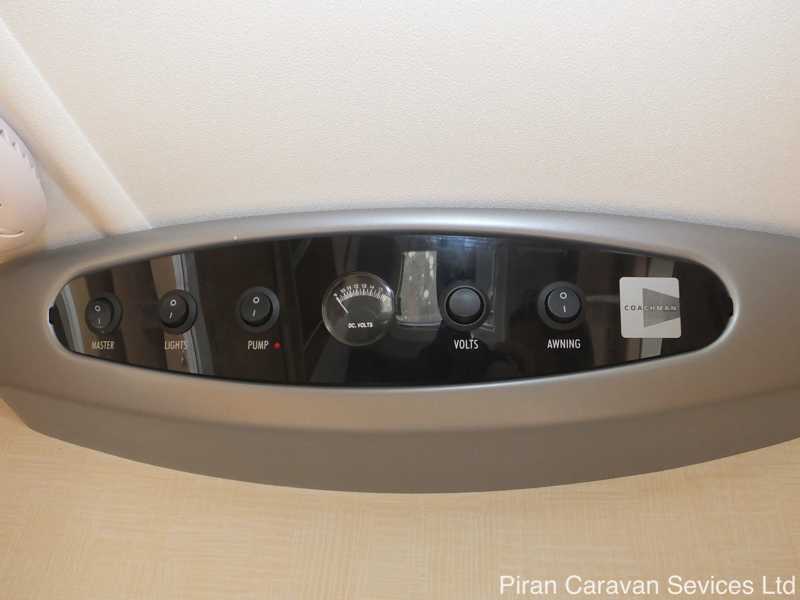 Other equipment in the Pastiche includes a BCA dual stage power centre and user-friendly control panel, and an exterior satellite input socket. 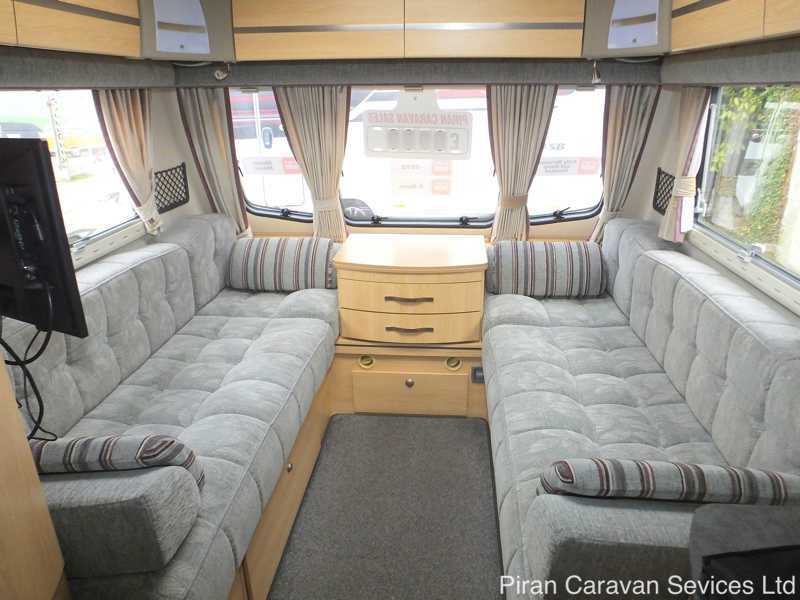 This Coachman Pastiche 470/2 is in excellent condition and will be valeted inside and out by us and has been fully serviced and damp-checked by an independent specialist, providing real peace of mind for its new owner. 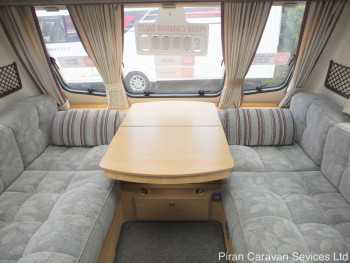 The Coachman Pastiche 470/2 has a dealer-fitted motor-mover, making siting the caravan a peace of cake, even on the trickiest driveway or pitch. 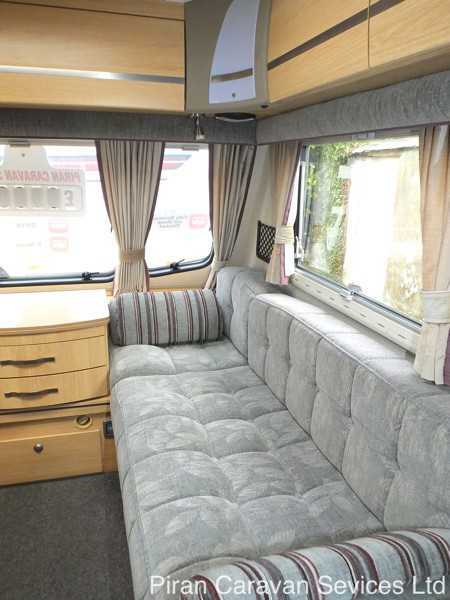 The Pastiche is also being sold with a large number of extras and has been fully serviced and damp checked by and independent specialist, makes this Coachman exceptional value for money. This high-spec and spacious Coachman Pastiche 470/2 touring caravan is ideal for a couple requiring an affordable 2 berth caravan that is ready to hitch up and take away for a luxurious and fun caravanning holiday! 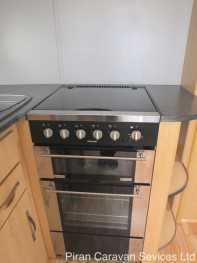 Call now for more details and to book a viewing.